FOR IMMEDIATE RELEASE: Lewiston, Maine (October 10, 2016) – New England Fights (NEF) presents its next mixed-martial-arts event, “NEF 26: SUPREMACY,” on Saturday, November 19 at the Androscoggin Bank Colisee. Earlier today, NEF executives announced the addition of an amateur featherweight women’s bout to the fight card. 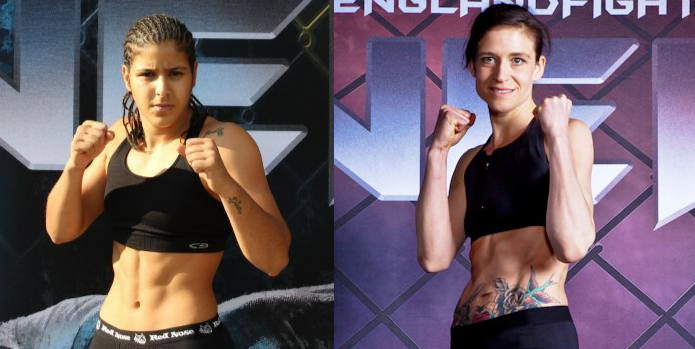 “Hollywood” Hannah Sparrell (1-1) is scheduled to meet “Ferocious” Fernanda Araujo (4-4-2) at a fight weight of 145-pounds. Hannah Sparrell made her NEF cage debut in September 2015 with a unanimous decision victory over Kira Innocenti (0-1). She returned to the cage last spring at “NEF 22” in a losing effort against Angela Young (1-2). That bout, a back and forth battle, has been one of the most memorable this year in NEF and could be in the running for “Fight of the Year” honors as well. Sparrell is a member of First Class MMA based out of Brunswick, Maine. “I’m super excited to be stepping into the NEF cage once again on November 19th,” said Sparrell. “For months, I have had friends, supporters and fans asking me when my next bout will be. I am happy to have a solid answer for them. Though I lost my fight to Angela during NEF 22, I left there with my head held high, a newly recognized confidence, and a hunger to get in the cage once again. Fernanda Araujo is also a veteran of the NEF cage. In 2012, she debuted in Lewiston against Maria Rios (2-3) in what turned out to be a bloody brawl. While she lost the bout via technical knockout in the second round, Araujo impressed the Maine crowd with her gutsy performance.